And if you go back farther in time, you’ll see that the Japanese version of Groundhog Day has been playing since the early 1990s. 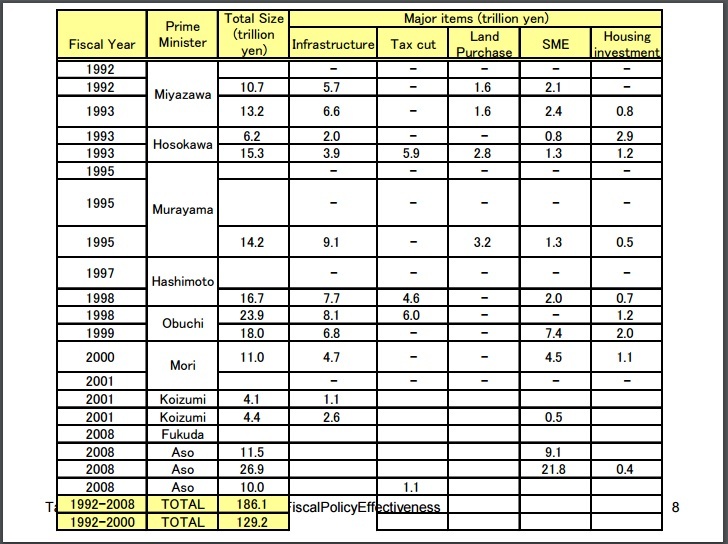 Here’s a list, taken from a presentation at the IMF, of so-called stimulus plans adopted by various Japanese governments between 1992-2008. And here’s my contribution to the discussion. I went to the IMF’s World Economic Outlook database and downloaded the numbers on government borrowing, government debt, and per-capita GDP growth. I wanted to see how much deficit spending there was and what the impact was on debt and the economy. 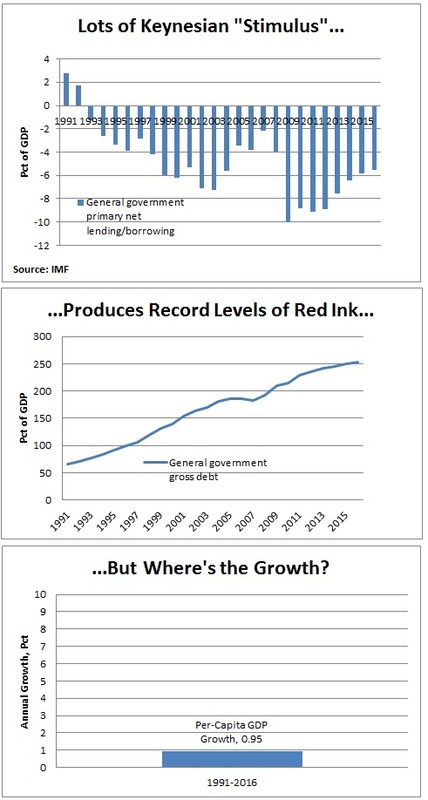 As you can see, red ink skyrocketed while the private economy stagnated. Though we shouldn’t be surprised. Keynesian economics didn’t work for Hoover and Roosevelt, or Bush and Obama, so why expect it to work in another country. By the way, I can’t resist making a comment on this excerpt from a CNBC report on Japan’s new stimulus scheme. In addition to lots of misguided Keynesian fiscal policy, there’s been a radical form of Keynesian monetary policy from the Bank of Japan. Here are some passages from a very sobering Bloomberg report about the central bank’s burgeoning ownership of private companies. Already a top-five owner of 81 companies in Japan’s Nikkei 225 Stock Average, the BOJ is on course to become the No. 1 shareholder in 55 of those firms by the end of next year…. BOJ Governor Haruhiko Kuroda almost doubled his annual ETF buying target last month, adding to an unprecedented campaign to revitalize Japan’s stagnant economy. …opponents say the central bank is artificially inflating equity valuations and undercutting efforts to make public companies more efficient. …the monetary authority’s outsized presence will make some shares harder to buy and sell, a phenomenon that led to convulsions in Japan’s government bond market this year. …the BOJ doesn’t acquire individual shares directly, it’s the ultimate buyer of stakes purchased through ETFs. …investors worry that BOJ purchases could give a free ride to poorly-run firms and crowd out shareholders who would otherwise push for better corporate governance. Wow. I don’t pretend to be an expert on monetary economics, but I can’t image that there will be a happy ending to this story. Just in case you’re not sufficiently depressed about Japan’s economic outlook, keep in mind that the nation also is entering a demographic crisis, as reported by the L.A. Times. All across Japan, aging villages such as Hara-izumi have been quietly hollowing out for years… Japan’s population crested around 2010 with 128 million people and has since lost about 900,000 residents, last year’s census confirmed. Now, the country has begun a white-knuckle ride in which it will shed about one-third of its population — 40 million people — by 2060, experts predict. In 30 years, 39% of Japan’s population will be 65 or older. The effects already are being felt, and this is merely the beginning of the demographic wave. Police and firefighters are grappling with the safety hazards of a growing number of vacant buildings. Transportation authorities are discussing which roads and bus lines are worth maintaining and cutting those they can no longer justify. …Each year, the nation is shuttering 500 schools. …In Hara-izumi, …The village’s population has become so sparse that wild bears, boars and deer are roaming the streets with increasing frequency. Needless to say (but I’ll say it anyhow), even modest-sized welfare states eventually collapse when you wind up with too few workers trying to support an ever-growing number of recipients. Now maybe you can understand why I’ve referred to Japan as a basket case. P.S. You hopefully won’t be surprised to learn that Japanese politicians are getting plenty of bad advice from the fiscal pyromaniacs at the IMF and OECD. P.P.S. Maybe I’m just stereotyping, but I’ve always assumed the Japanese were sensible people, even if they have a bloated and wasteful government. But when you look at that nation’s contribution to the stupidest-regulation contest and the country’s entry in the government-incompetence contest, I wonder whether the Japanese have some as-yet-undiscovered genetic link to Greece? The bus’ engine is filled with honey rather than oil. So Japanese politician drivers (and their voter-lemming riders) are doubling down on depressing the accelerator even further. They are hoping to carry their voter-lemmings another four miles before the engine suffers even more irreversible and irreparable damage –perhaps fuses altogether. The people are finally taking collective control of their economy. Their central bank is taking over companies. That way the dream may one day become true: That finally,… one hopeful day, …. people will work for the common good, instead of their families and themselves. The eternal voter lemming dream lives on. The road to serfdom progresses — and, of course, a sub 1% growth trendline is taking the country into accelerated decline. It took over 150 years for Japan to build enough prosperity to join the developed world. 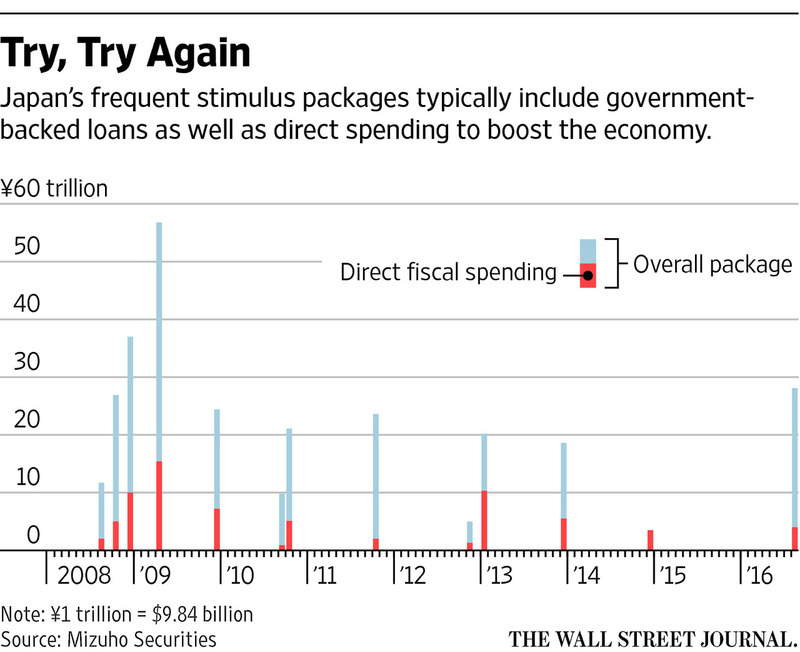 On this trajectory, Japanese voter-lemmings are squandering their prosperity within a few decades. At current growth deficit trendline ( compared world average), Japan will be reached by the middle-income country group of this world by 2050. Way to go voter-lemmings of Japan! But why not double down even further on coercive collectivism dear voter-lemmings? One of these days the dream will become reality. The economy is about the production and exchange of goods and services. When goods and services flow in one direction, money flows in the opposite direction. Money is just a way of measuring the value of the goods and services. But some economists have declared the economy is about the money (wealth) rather than about the goods and services. Liberals think redistribution of wealth is the key to an improved economy, wall streeters think the accumulation of wealth is the key. Not much difference in the approach really. Both are not focused on the production of goods and services.